Apple-o-Meter is a cool distance measurement application for iPhone that lets you measure objects by inch, cm, and apples with your phone and master the art of flawless measurement. 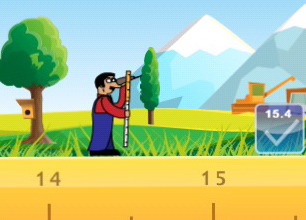 The app comes with good looking graphics and makes measuring things much more fun. Here is how the app works. You should first set a measurement unit. Don’t forget to set your reference point as well. Then you put the lower side of the device at your starting point and roll it along to measure your object up. Once done, you can store it for future use. It’s going to take a bit of practice to get more accurate with Appl-o-Meter, but once you get comfortable with it, you are not going to stop measuring! All in all, Appl-o-Meter is an innovative application for iPhone that lets you turn your gadget into a measuring device. It not only makes measuring things fun, but goes on to show the true power of iPhone SDK. Highly recommended.